Motivation and Stress: An Inverse Relationship? So I was chatting over the last few days with a couple of athletes I coach, helping them to be a little kinder to themselves during what is a challenging time in their lives. We all have our battles to fight - life is just like that sometimes. So often we go through periods of time where stress and anxiety levels are higher than we want them to be. Maybe it's a personal or family difficulty, or dissatisfaction at work, health issues with someone close to us (I am living this right now unfortunately), economic challenges, or just flux and change, which in and of itself, can cause a ton of stress. What ALL of us need to remember is that when stress levels are HIGH, it is natural and normal that our energy and motivation may wane. In other words, stress and anxiety exist in inverse of boundless energy, internal drive, and motivation. The problem comes when we don't see this inverse relationship, and we begin to ADD to our stress levels by berating ourselves for not "wanting it" more, or working harder, or trying to have the same level of motivation we might have had in the past. The issue IS NOT that you don't care or that you don't "love it" anymore. More likely, it's your body in flight-or-fight mode causing stress hormones to course through the bloodstream. The BEST thing for you to do at any moment MIGHT be TO train, but sometimes that is the last thing you want to do! 1. In times of stress, stop beating yourself up for any lack of drive or motivation. See this for what it is, an inverse relationship. Treat each day as a NEW day, and strive to be better. Take one session, one task, at a time. Smile more, you'll feel better! 2. Try to take a "bird's eye" view of everything, and remember that your body has only so much (limited) energy available to sustain life, repair damaged tissue, digest nutrients, handle emotional stress, handle cooling during hot, humid weather, AND complete those challenging training sessions, among many other things. During stressful times, something has to give, and sometimes that needs to be your training. If you need to take a step back or a few days "off," you won't lose your fitness. In fact, you might return to your routine feeling better than ever. 3. Seek ways to alleviate the stress. Facing the issues causing the stress and taking action to change the situation as best you can is a smart strategy. Just don't bite off too much at any one time. 4. If the circumstances are out of your control, do your best to JUST DO IT, knowing that you will nearly always feel better AFTER exercise or training, regardless of the situation. 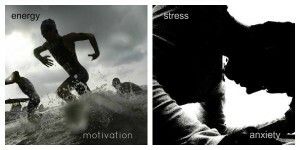 Exercising is a great stress reliever, first and foremost. The added bonus is that you will have done something positive for YOU, leaving you feeling better about yourself. Endorphins will also enhance your mood. 5. The reality is, motivation is overrated. #inspirational memes are overrated. Sometimes you have to come back to the discipline and dedication to do what you know you need to, simply because you care. Danny Kavadlo (Progressive Calisthenics trainer at DragonDoor) wrote a great blog post yesterday on this same topic called "Take Hold Of The Flame." I recommend you take a moment to read it. The bottom line? Sometimes you need to just be kind to yourself. Seek balance as the best path toward optimal training. If at first you don't succeed, try and try again. Keep smiling, keep it fun, and don't be so damn hard on yourself. None of this gives you permission to slack. But, rather, be honest, compassionate and kind to the most important person in the world: Y O U!